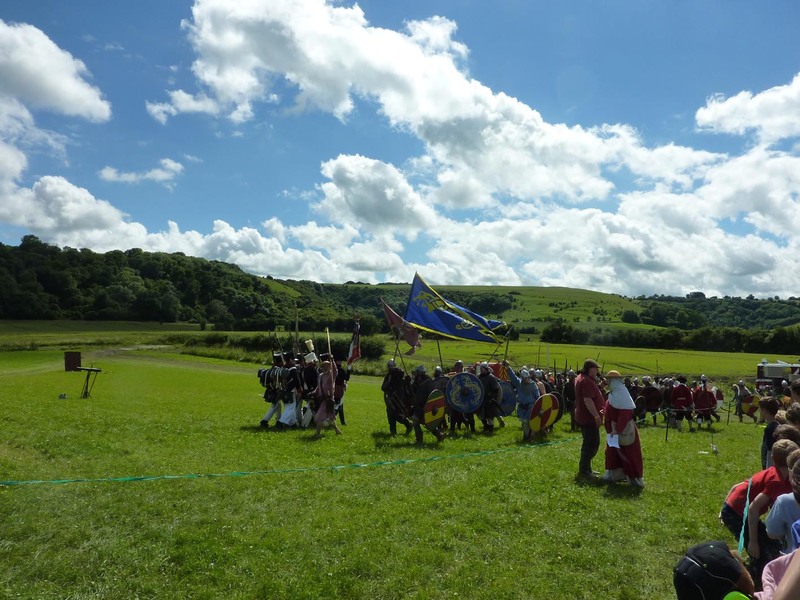 I had been looking forward to the Chalke Valley History Festival for a long time. 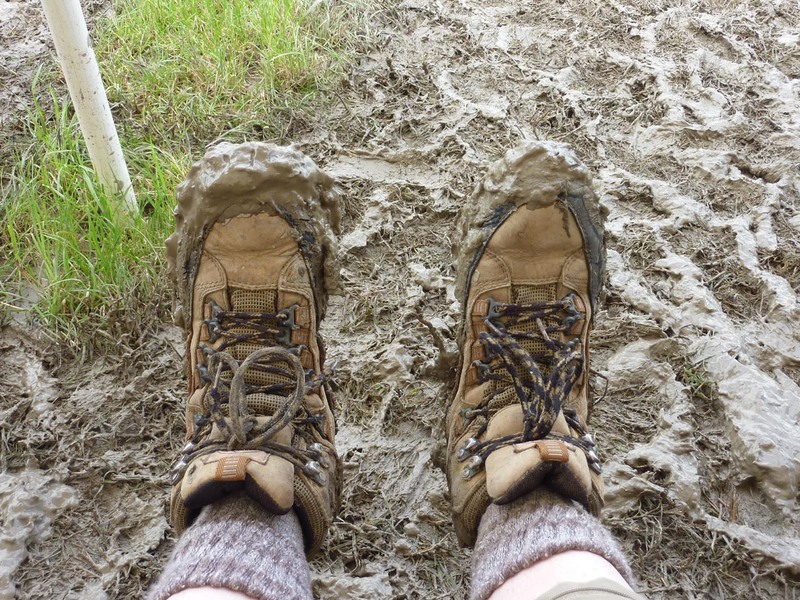 I had been following the lead up to the event on Twitter and noticed a comment that it was “Glastonbury for Historians” – I didn’t realise they were talking about the mud! I already knew before we left home that Wellingtons would be needed. However there was not room in the car for them, but we had our walking boots. They would have to do. 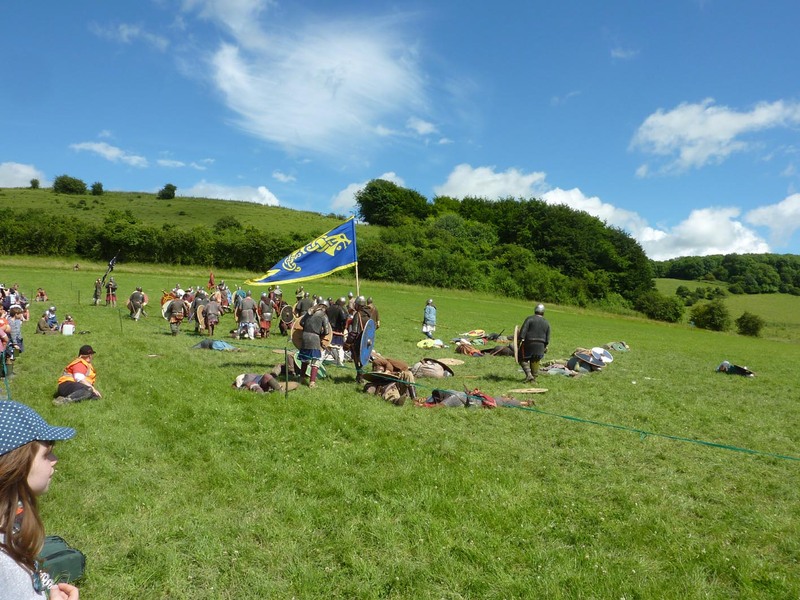 We set off from Shaftesbury on Sunday morning. The forecast was cloudy, but rain was not expected. We followed the signposts from the main road. We drove on, and on, down narrow country roads. We seemed to be driving in circles. 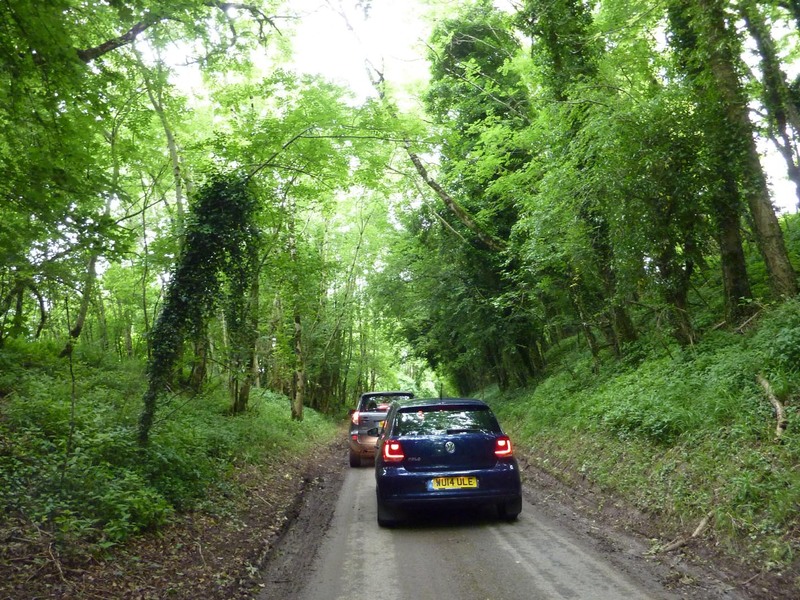 Finally we reached the back of a queue of cars – nearly there. It must have been getting on for an hour before we reached the entrance and discovered why the progress was so slow. The car park was a muddy field. Cars drove up the hill on a road of boards. At the top, marshals directed each car individually to a parking spot – a mad dash through the mud. I imagine they still wake in the night shouting “Keep going! Second gear!” Tractors were available for those who couldn’t make it. Next came a logistics problem. Sitting in front of car in ordinary footwear. Walking boots in boot. In between, thick mud. Another pair of shoes to clean later. After a muddy walk to the entrance we finally arrived. More mud. After locating the loos (plenty of them and no queues), we headed uphill to the Living History area. 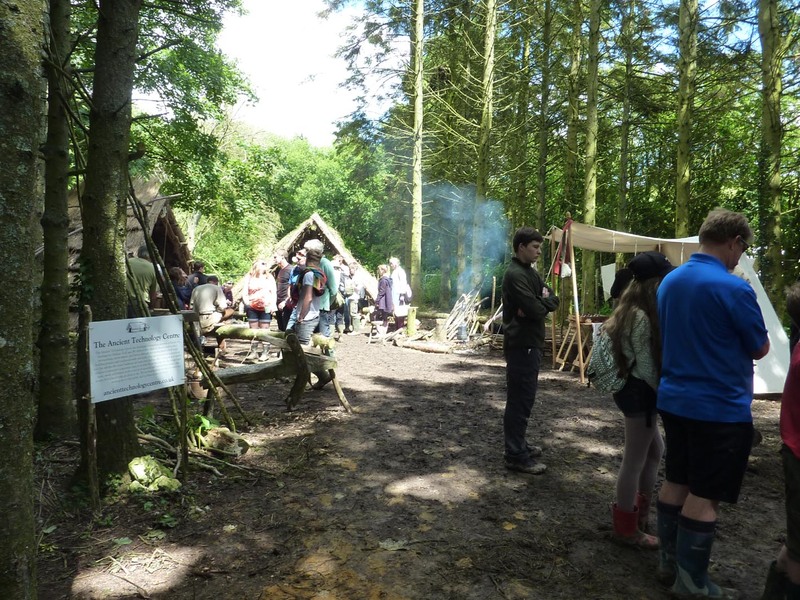 There was less mud here and we talked to Celts about the usefulness of lime for sun protection and their everlasting cauldron. 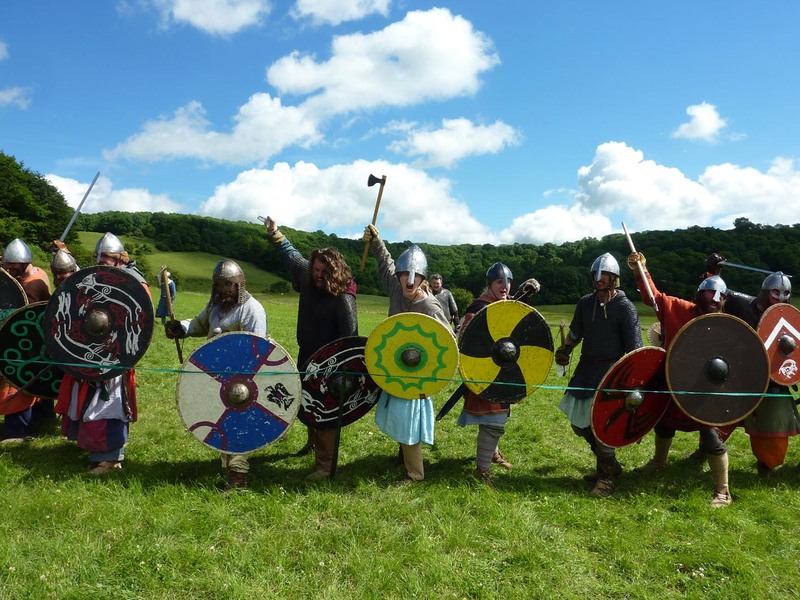 We found out about from Vikings about making chain mail and how often Anglo-Saxons washed. 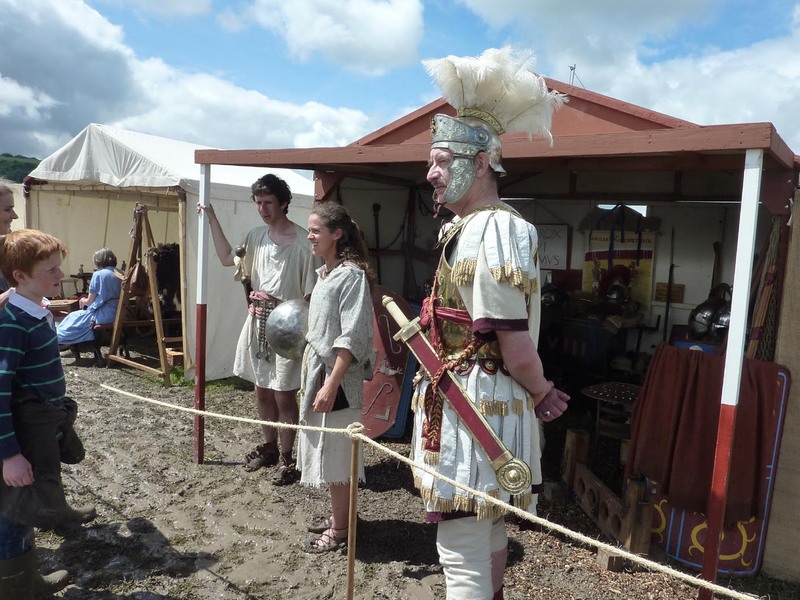 We heard from a Roman doctor about trepanning and a falconer about hunting with hawks. 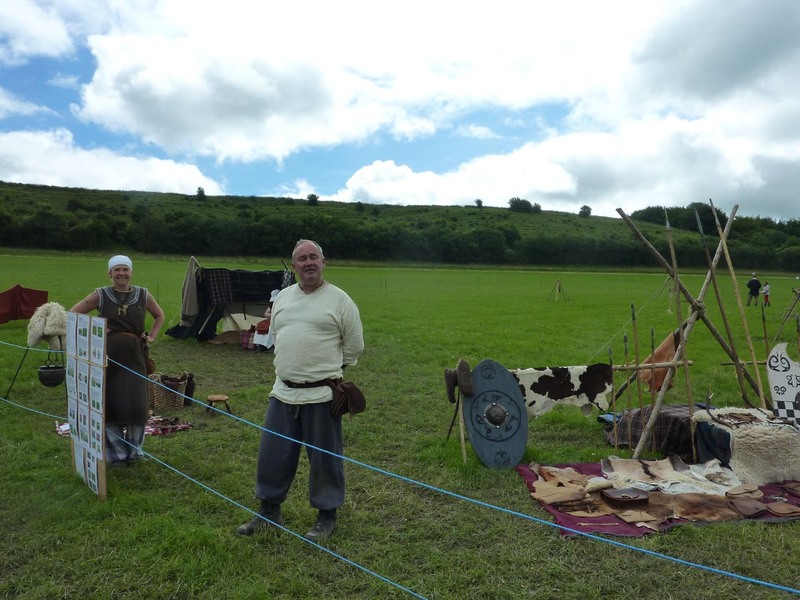 We watched fights by Saxons and another between medieval knights. We saw men and women from different eras mingling and unusual juxtapositions. Multi Era Team Meeting. Romans telling everyone else what to do. 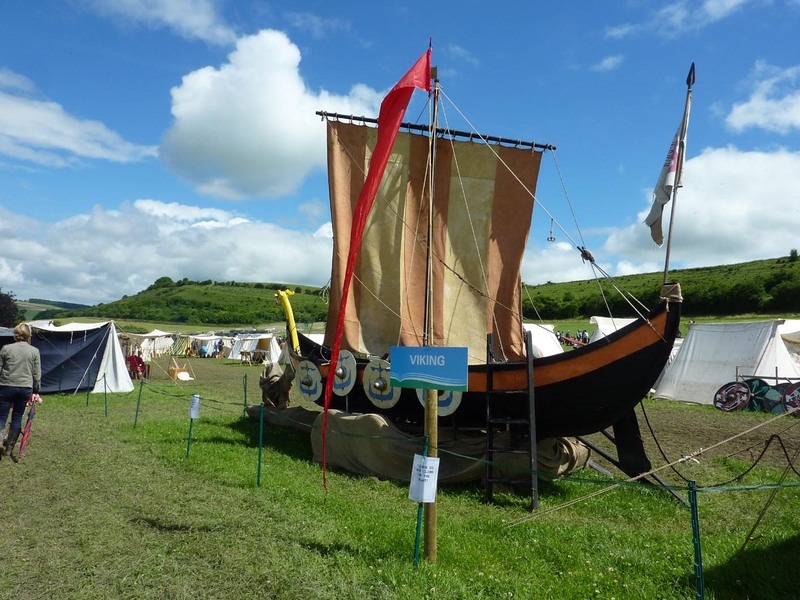 Viking Ship with a rather superfluous sign. 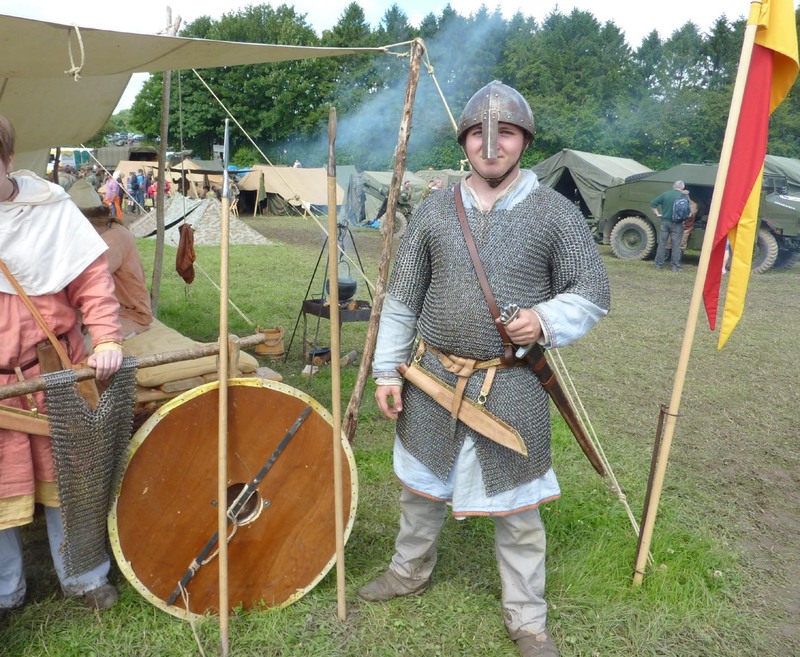 Viking Warrior – not an Anglo-Saxon. How do you tell the difference? Q. 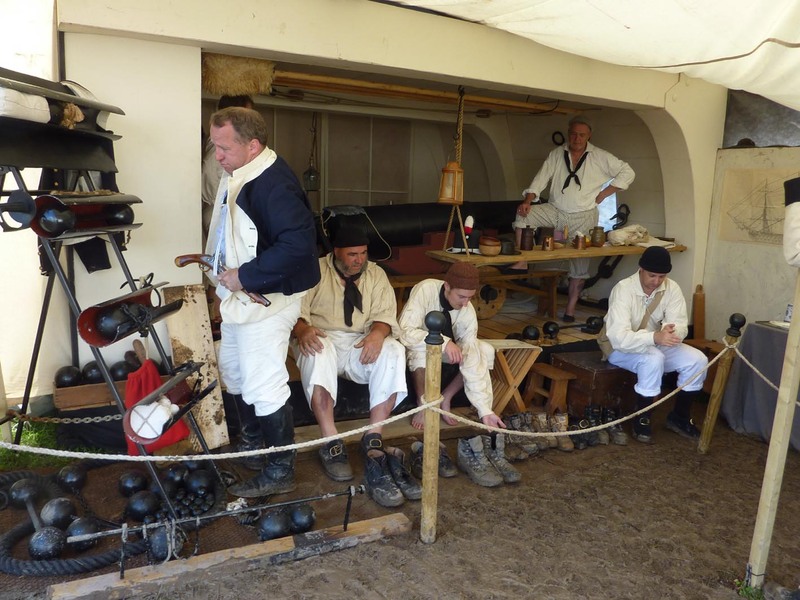 How do you keep the gun deck of HMS Temeraire clean? A. Leave your boots outside. 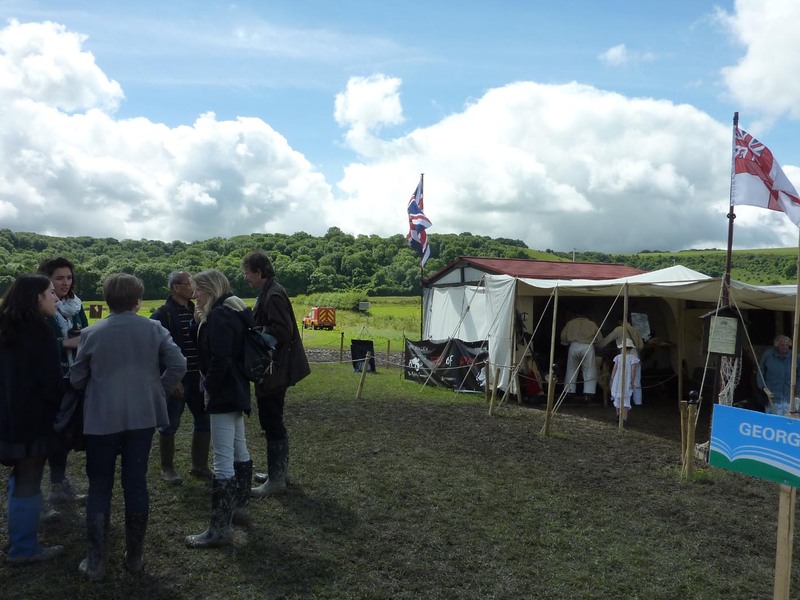 Famous Historian holds court in muddy field. By now we were getting tired and hungry. 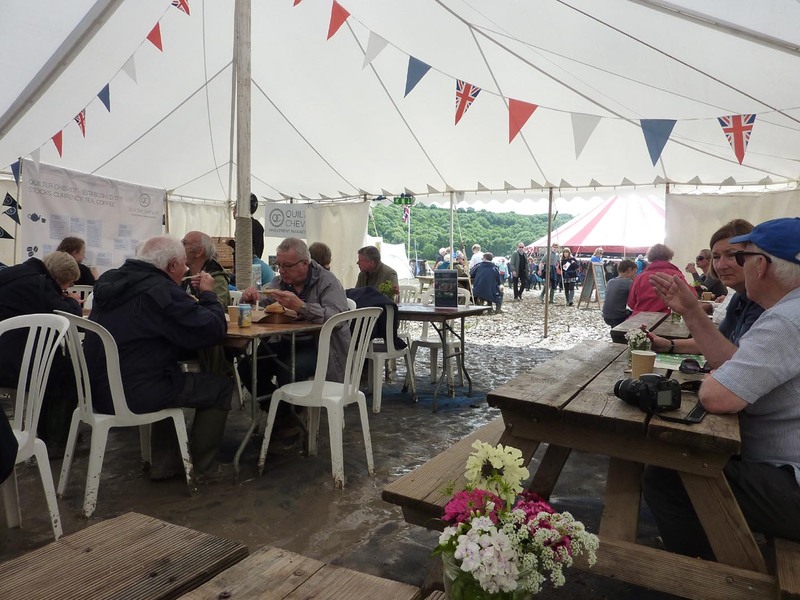 We found a cafe, but it was difficult to sit at a picnic table without getting mud all over the seat – the cakes were nice though. We visited the book shop – another disconcerting experience. You appear to be browsing in an ordinary Waterstones, but the floor is covered in mud. I was starting to get fed up. It was difficult to wander round some of the damper areas. You had to look where you were going, then stop to look around. Spend too much time in one place and it was difficult to move on. If we hadn’t booked for a late talk, we might have left – that and the thought of the long walk back to the car. 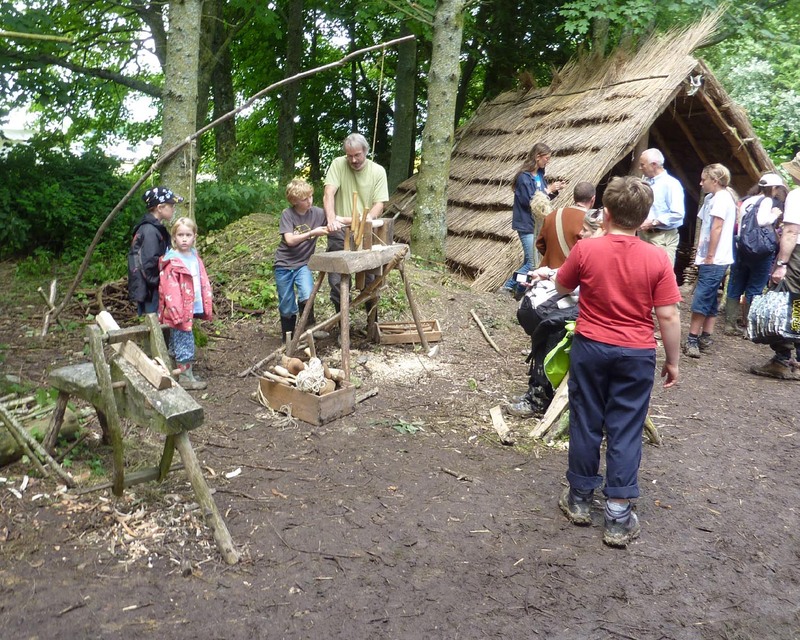 It was while we were searching for drier ground that we found the Anglo-Saxon Settlement. I had been looking for it, but it was hidden away in some trees. 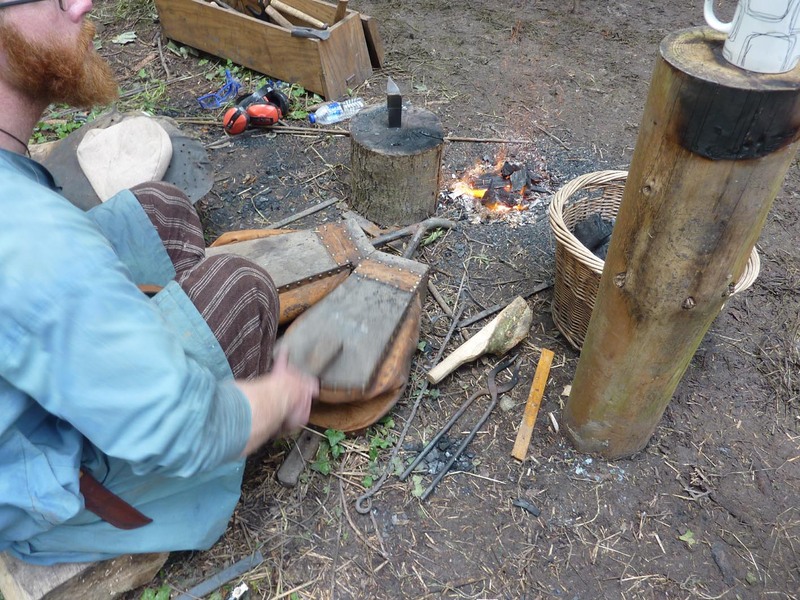 We watched a smith working to make iron on a small fire and children having a go at turning wood. 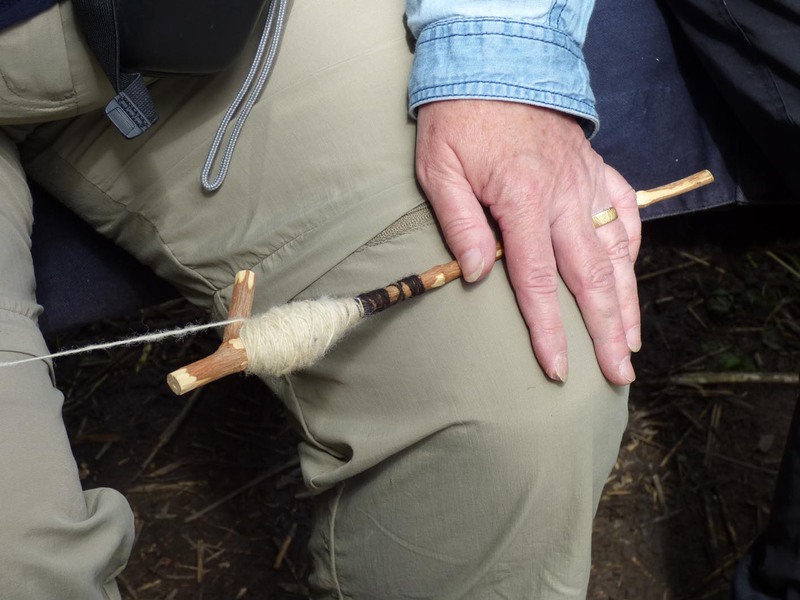 We were taught (unsuccessfully) to make bird calls and I had a lesson in spinning wool using only a twig. 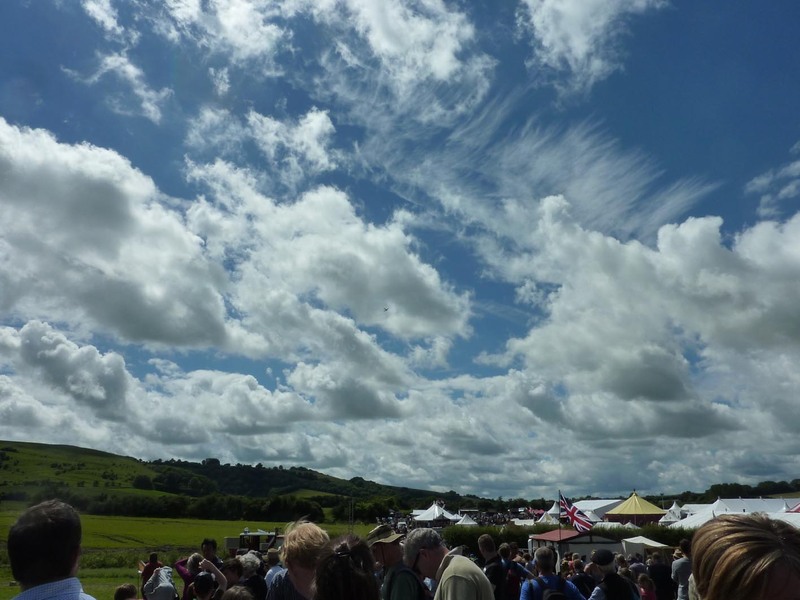 Clouds – can you spot the plane? The sun had come out and things were starting to dry out a bit. 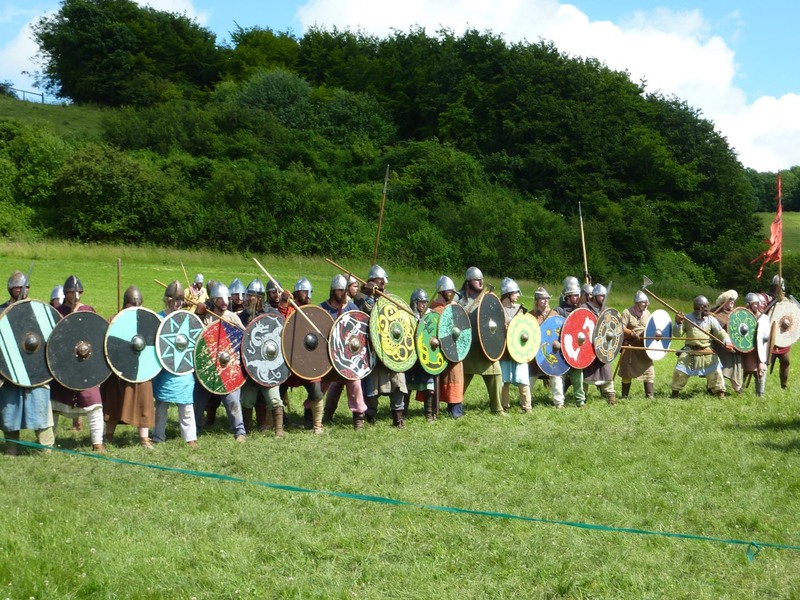 We heard that there was a display of weapons through the ages before the Saxon v Viking battle, so we made our way over to watch that. Of course, throughout the day, heads turned to the sky to watch old planes pass over. The commentaries and announcements in general were very clear and easy to hear. 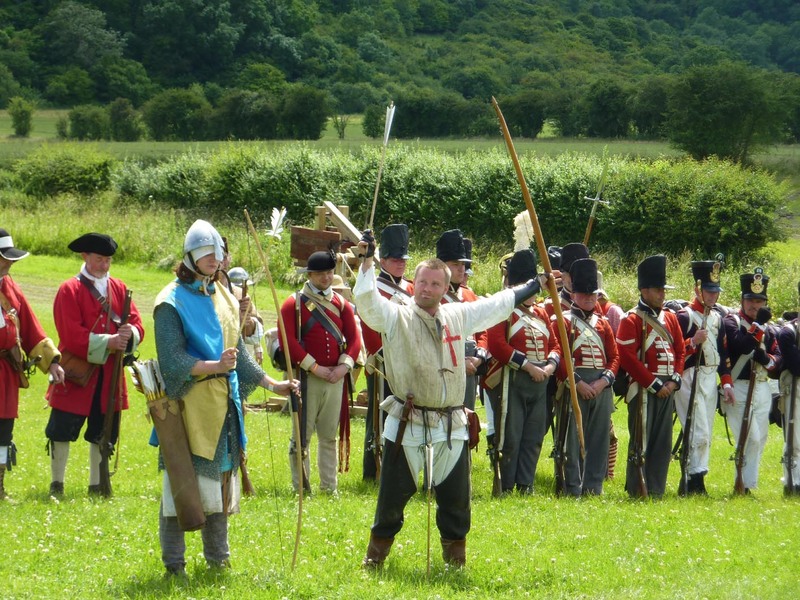 The demonstration of weapons through the ages was fascinating, from the earliest spears and bows, to “black powder” muskets and rifles. 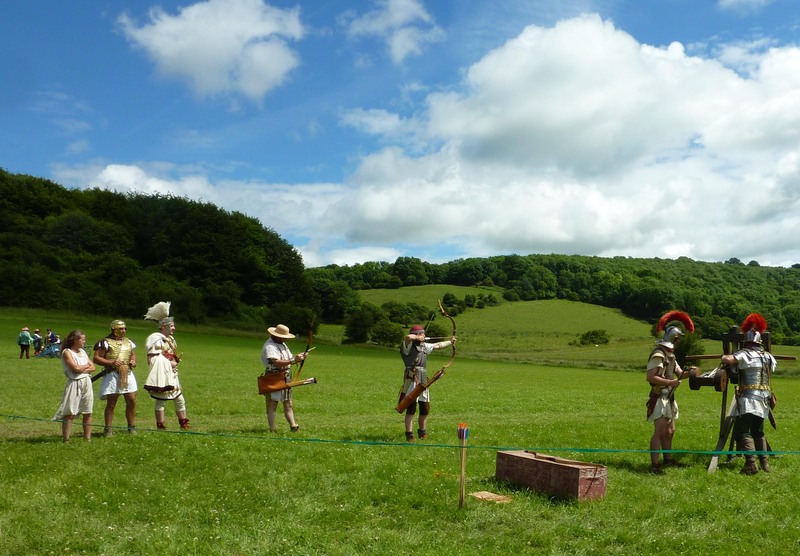 Larger weapons; a Roman trebuchet and ballista, cannon and field guns. The display finished with a Napoleonic battle between France and English, although the French refused to die. The archers show off their bows while redcoats wait their turn. Roman Ballista. Efficient but takes a long time to load. 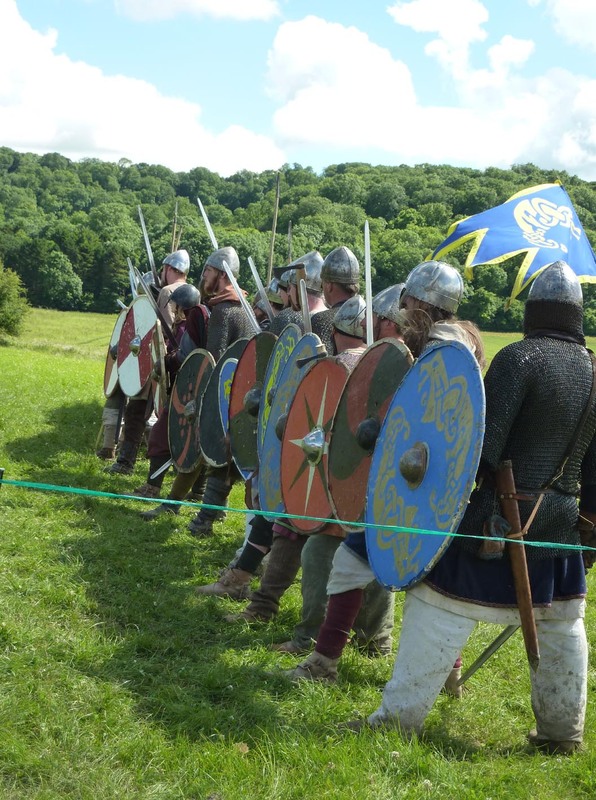 The Saxons arrive in time to finish off the French. The Vikings wait on the hill. The beaten Vikings run away. 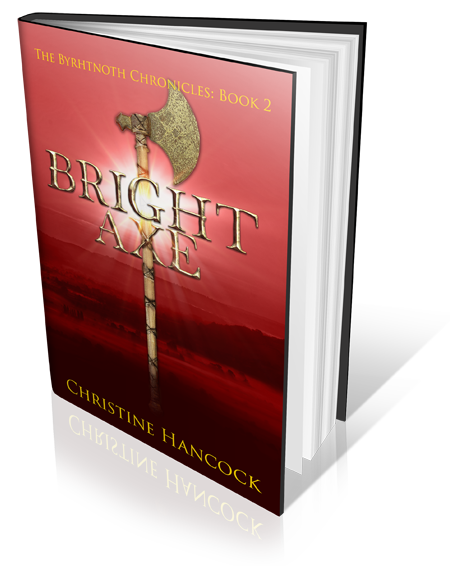 The dead were re-animated and there were other fights – a “Circle” – a knockout fight with one winner. It turns out that there are rules in these re-enactment encounters. 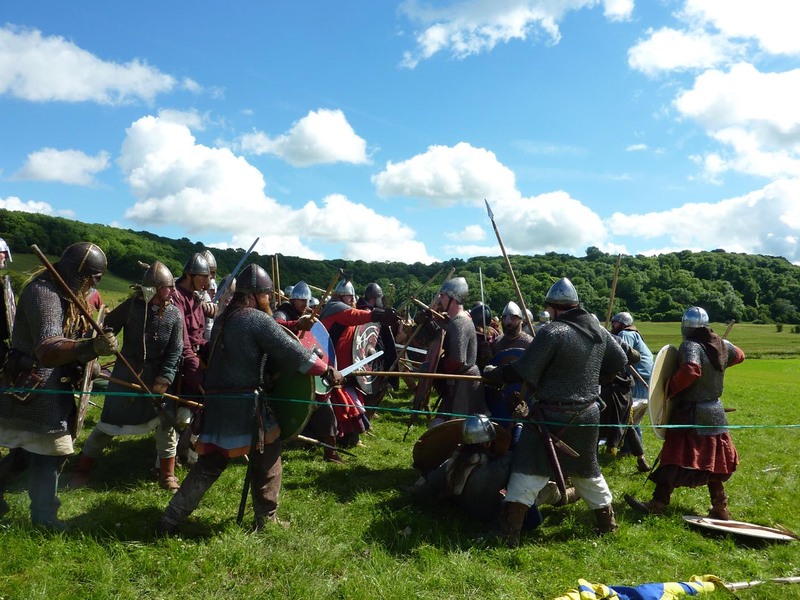 You don’t get the full experience of a proper Anglo-Saxon battle, they aren’t actually trying to kill each other, after all. But it is the closest I will get and it’s quite scary when they charge you head on – I regretted having wormed my way to the front of the crowd! See the video here. When the battle was over, we went and found an ice cream. While waiting at the van, the tanks nearby started up and moved away. Later we could hear their battle from our place in the queue for our booked talk. At last, somewhere to sit down. The talk by Tom Holland on Athelstan was interesting. He told us about the coins he has acquired that tell the story of how Athelstan became King of all England. English history does not start in 1066, but over a hundred years earlier with King Athelstan. Tom has written a biography of Athelstan, published just before the Festival. I intended to buy a copy and get it signed, but by the time I reached the bookshop, I couldn’t get in the door. Time to leave. The sun had dried some of the mud. It was surprising it cleared so quickly, but with the underlying chalk it had not been thick, just wet and slippy. 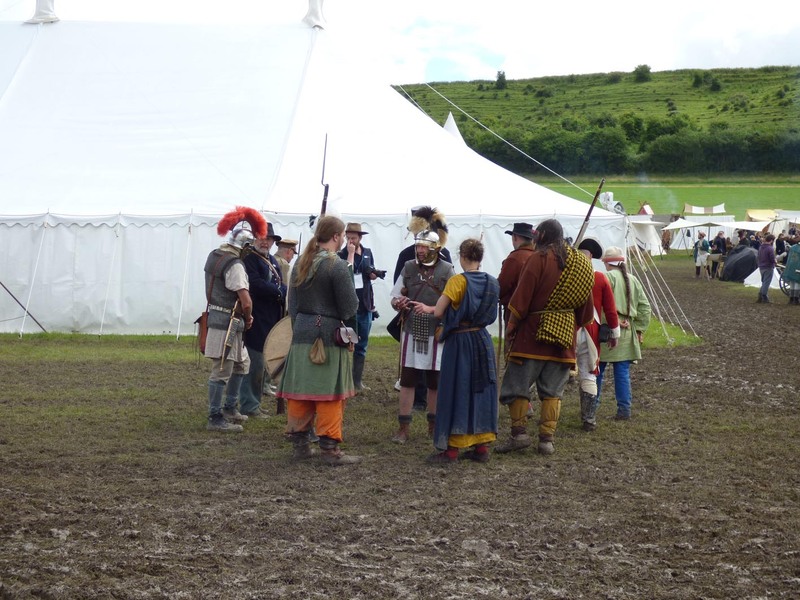 So, had I enjoyed my day at Chalke Valley History Festival? By the end of the day, yes. I might have enjoyed it more without the mud, but at least it didn’t rain as well – in fact I got sunburned! I learned a lot, took loads of photographs to inspire my writing and gained an understanding of life in the past – how on earth did they manage without paved roads?